This comprehensive report by Transparency Market Research analyzes the global fluid management market for the period 2017-2025. An in-depth and unbiased market assessment has been made, which offers readers an in-depth and accurate analysis. Market projections have been offered in terms of value (US$ Mn). Stakeholders of this report include companies and intermediaries engaged in the production and distribution of fluid management products as well as new entrants planning to enter this market. The global fluid management market has been studied for the forecast period of 2017 to 2025. For the research, 2016 has been considered as the base year and 2015 as the historical year, while all forecasts have been provided from 2017 to 2025. The global fluid management market report comprises an elaborate executive summary that provides overall information about various segments of the market. The report provides a detailed competitive landscape, by major players operating in this market, along with their shares (value %) of the global fluid management market for 2016. The report also provides detailed company profiles of emerging market players operating in the global fluid management market. The market overview section comprises impact factors such as key market dynamics including drivers, restraints, and opportunities, affecting the demand for medical waste management services globally. These factors would aid the stakeholders in establishing a strong foothold in the global medical waste management market. Furthermore, the market overview section comprises key industry events, product overview, and market attractiveness analysis of the global medical waste management market. The market attractiveness analysis provides a graphical view comparing the expansion and market dynamics in various segments and countries to identify the most attractive areas. The global fluid management market can be segmented based on product, application, geography, and end-user. 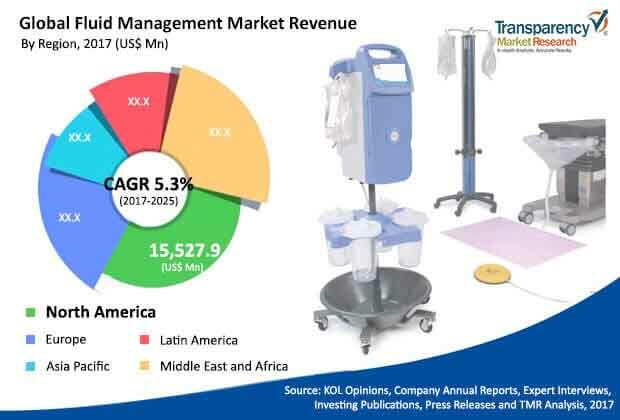 In terms of product, the global fluid management market can be classified into infusion therapy products, renal fluid management products, and endoscopic fluid management products. The infusion therapy products segment can be further categorized into infusion devices, IV access devices and accessories, and IV solutions and products. Renal fluid management products include all the standalone and integrated devices and accessories required for the dialysis procedure. The renal fluid management products segment can be further classified into in-center dialysis products, home-hemodialysis products, peritoneal dialysis products, and acute dialysis products. Based on end-user, the global fluid management market can be segmented into hospitals, clinics, dialysis centers, home care centers, and others. In terms of geography, the global fluid management market can be categorized into North America, Europe, Asia Pacific, Latin America, and Middle East & Africa. Moreover, analysis for major countries such as the U.S., Canada, Germany, France, the U.K., Italy, Spain, Russia, China, Japan, India, Australia, New Zealand, Brazil, Mexico, South Africa, Israel, and GCC countries has also been provided in the report. A detailed qualitative analysis of the factors responsible for driving and restraining the expansion of the fluid management market in various regions has been provided in this section. The report provides a detailed outline/blueprint of the fluid management market globally that will assist new companies in establishing their presence in the market and existing players in expanding their market share. The report concludes with the company profiles section, which includes company overview, financial overview, SWOT analysis, product portfolio, business strategies, and recent developments for market players. Major players operating in the global fluid management market include Baxter, Fresenius SE & Co. KGaA, Nikkiso, Co., Ltd., C.R. Bard, Inc., Olympus Corporation, Ecolab Inc., Medtronic, Zimmer Biomet, BD, Smith & Nephew, Hospira, Inc., Animas Corporation, B. Braun Holding GmbH & Co. KG, Cardinal Health Inc., Stryker, Boston Scientific Corporation, Karl Storz GmbH, Richard Wolf GmBH, Asahi Kasei Medical Co. Ltd., Coloplast Group, NIPRO Medical Corporation. Other prominent players in the global fluid management market includes AngioDynamics, Promed Group Co., Ltd, ICU Medical, Inc., CONTEC MEDICAL SYSTEMS CO.,LTD, SWS Hemodialysis Care Co.,Ltd., Dialifegroup.com, and Medica S.p.A.